If you're looking for a pet you can have for a lifetime, an African grey parrot is one to consider. 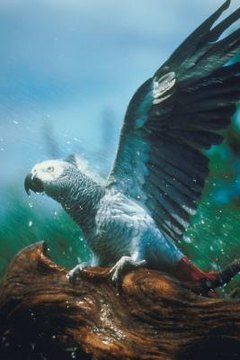 Two species of African grey -- the Congo and the Timneh -- differ in size, the Congos growing up to 14 inches from head to tail and the Timneh remaining under 12 inches. Provided with good nutrition, either species can live between 50 and 70 years. Wild-born African grey parrots are thought to live longer than those raised exclusively in captivity. Life span in the wild is up to 80 years; one specimen is known to have lived to 90 years. Captive-bred African grey parrots average 50 years, but some parrots may die at 30 or 40 years of age. Baby parrots less than 6 months old have dark grey or black eyes. The eyes lighten to a pale grey color by 1 year old and to a pale straw color by age 2, deepening to yellow by 3 or 4. Your African grey parrot will grow to maturity in his first 4 to 5 years. Determining the age of a mature bird is best accomplished through a veterinary exam. What Are the Types of African Greys?